So after all the stressful planning, the filming and the late nights, the second Live from Worktown festival of the spoken word is over. Well I say over, you can still buy copies of our accompanying poetry anthology with contributions from all over the UK and beyond, not to mention a long overdue reissue of Hovis Presley’s bestselling collection “Poetic Off-License”. Sometime soon the committee will have a review meeting to consider what succeeded and what could have been done better. Plus you can watch my videos of many of the events, which I’ve been busy editing during the course of the festival. I’ve put them together into a Youtube playlist below. You’ll find local poets like Jefferama and Louise Fazackerly rubbing shoulders with major names like John Hegley and Brian Patten. I think the part of the festival I’m most proud of is the connections it makes between people, connections which might flower into new creative projects, or just make people’s lives a bit brighter. Highlights for me have been the energy, enthusiasm and sheer quality of the performers on the INSYT Media vs Young Identity evening. 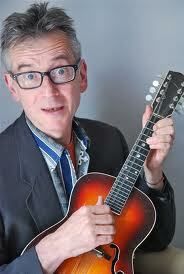 John Hegley’s hilarious clever set, and the good feedback I’ve had from the Hovis Presley night. The latter was the evening I was overseeing and it pushed me into new responsibilities and has given me more confidence for future happenings. Low-lights have been the problems of finding good venues for our festival programme, money worries when it looked like our Arts Council grant application had failed and trying to think of new ways to promote the festival at the eleventh hour. However I think Live from Worktown as a brand has definitely raised its profile and reputation significantly this year. Most of the credit goes to Dave Morgan, Scott Devon, Paul Blackburn and Louise Coulson for all their hard work. Now its time to put some of my other projects back on the table and get them completed. Hopefully I’ll have more to tell you about soon. Thanks for reading. Live from Worktown 2015 has begun, with three well received social events, including the launch of the Anthology, an evening with Flapjack Press and a debate on which famous poet to throw out of a balloon. I’m gearing up to film several of the coming events and put edited versions online. Expect a compilation post once they are up. But I just wanted to take the time to recommend two of our flagship events. As well as running an afternoon workshop which is nearly sold out. John Hegley is presenting his marvellous combination of poetry, comedy and music on 18th May at the impressive theater space of Bolton College. A favourite on the radio and music festival scene he first came to prominence on John Peel’s radio show. Hegley’s poem ‘Malcolm’ is one of the nation’s most popular comic poems. Mandolin-playing Hegley delights in audience participation. 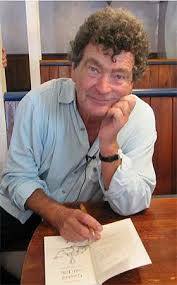 Brian Patten came to prominence, along with Roger McGough and Adrian Henri, in the 1967 best- selling Mersey Sound poetry anthology. Since then he has performed at the world’s leading literary festivals and has published several very award winning collections. He also writes for children and is a highly engaging performer. On 21st May he will be sharing the performance space of Bolton Central Library with another award winning poet – Mandy Coe.